Lately, mermaids have garnered a lot of well-deserved attention from the public. First of all, they have enviable extra-long hair that's tousled daily by the salty ocean waves. They're also covered in shiny gorgeous scales which reflect the sun's rays, making them a beautiful shimmering vision. Last but not least, their tales are mesmerizing. Flopping out from the water and decorated with iridescent scales, their tail is what separates them from mere land-folk like us. If you've ever wondered what it would feel like to flick around a flashy tail around, then we have the perfect garment for you. These blue mermaid leggings conform conveniently to all body types, giving women a flattering and tailored appearance. These costume pants feature printed fish scales as well as flared bottoms to create the illusion of a fish-like tail. Congrats mermaid, you're almost ready to make a splash with your costume but first you must put the whole look first together. 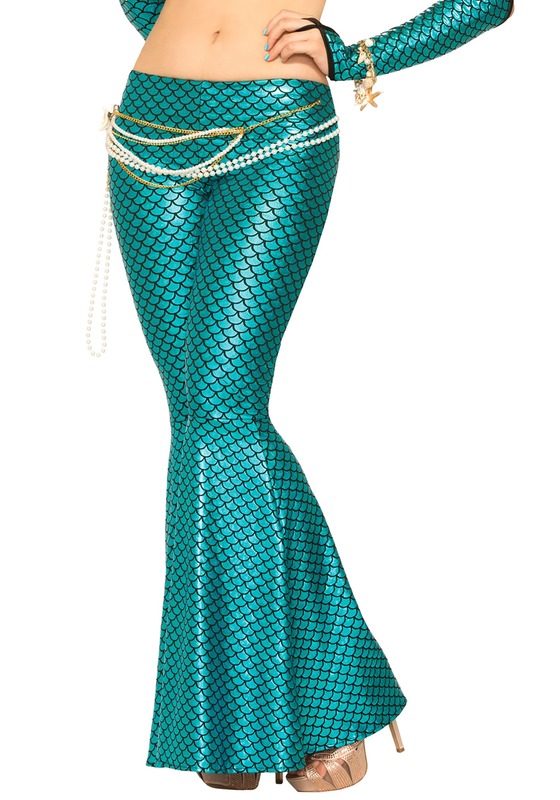 Once you've picked out a lovely shell halter top, the matching mermaid sleeves, and sparkling seashell jewelry then you're ready to wow fellow costumers with your impressive tail. They're going to be saying "Ariel, who?" once they see you glide past them in these one-of-a-kind leggings!